We had some horrible weather on Saturday, with strong winds and much colder temperatures it was looking like winter had finally arrived. The fact I had to defrost the car this morning seemed to confirm it although thankfully the wind had dropped. I got to the pub fairly early and there was a decent turnout of eleven and a quick look at the section boards revealed Rob had pegged Redbridge, Isle Brewers and Hambridge, all great areas but the pegs I really fancied were the weir pool at Isle Brewers (120) which has been very consistent or one of the two pegs below Hambridge which I’ve never drawn. I didn’t particularly want to be above the bridge as all three pegs struggled when we were there a few weeks back. Rob announced the draw and said the two golden pegs were 129 and H3, both have won plenty of matches so there was a good chance somebody would be collecting a bulging brown envelope today. When I stuck my hand in the hat, there was only one peg left which turned out to be H4 which is the first peg above the bridge and I was pretty disappointed, it can be a really good peg but I still think it’s a bit early for it. The two golden pegs went to Jake (on 129) and Rob drew his second on the trot in this league which put him on H3 and I’m getting him to pick my lottery numbers next week! We got to the river and it looked lovely, nice tinge of colour with some pace and I started to think we might be in for a really good day, especially as there were no bullocks in the field today, the only thing that slightly worried me was that there were no fish topping. Leighton Cox was above me on the bend with Stu Alford on H6 where I was in the last V.E.S. match and he accepted when I asked if he wanted a side bet. I set up a 0.6 gram DH16 and a 1 gram bodied float, both with 0.12mm hooklengths and size 18 B611’s. 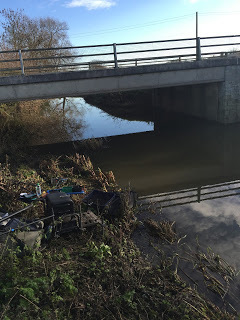 I plumbed up and had a nice depth to my right and straight out in front but the peg shallowed up towards the bridge. Rob shouted the all in and I started on the heavier rig with double red maggot on the hook at 8.5 metres down the middle. I was inching the float through when it buried and the strike resulted in a pleasing amount of yellow hydro coming out of the pole tip before I swung in a 4oz roach. I had a slightly smaller one next chuck before the next one was smaller again so I switched to caster to see if I could catch some more quality. It didn’t really work and I was just waiting longer for bites, I could see Rob below the bridge and he was catching small fish regularly as was Leighton above me. After an hour I had 17 fish for a pound or so and I knew that was way off the pace to do any good today and I needed some better fish to start showing. I saw Leighton net a decent fish and shouted up to ask what it was, he said it was a chub around 2lb so at least they were in the area. Heardy was below Rob and although I couldn’t see him, I could hear him and it sounded like he was catching some nice fish although he was suffering quite a bit of pike trouble. 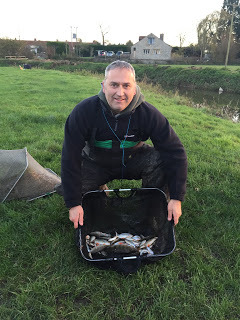 I kept swapping between caster and double maggot and was getting odd small roach but after a promising start I wasn’t putting much in the net. 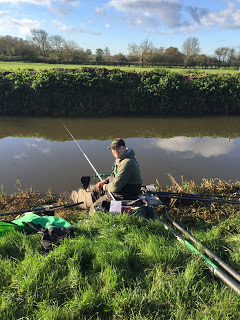 I tried fishing a section shorter to see if I could catch the small fish quicker but after an initial flurry of fish I went back to struggling. A big pike kept making it’s presence known under the bridge but so far it had left me alone and I don’t think the tiny fish I was catching were a big enough meal for it! Rob was still catching lots of small fish with the odd netter among them, Martin had a decent perch and I didn’t know what to do next! I said to Stu before the match started that I thought 20lb would be needed to win today but after two hours I knew it wouldn’t be me! I was getting more bites with the lighter rig but mainly from small fish so when I laid the rig in and the float sailed away I was expecting another small roach but this time a fair bit of Drennan Aqua elastic came out of the pole, the fish plodded about and I knew it would be a perch and it was, not a monster but at 10oz it was very welcome and hopefully there were a few more where that one came from. I could hear Martin getting very frustrated as every time he hooked a better fish, pike were coming from every direction to snaffle it and there was even a pike attacking his keepnet! While Heardy was getting frustrated with pike stealing his better fish, I was equally annoyed that apart from that perch I couldn’t catch anything that required me to get my landing net wet! 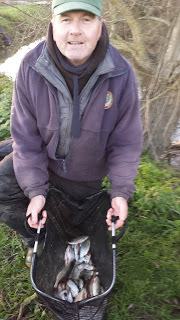 I tried shallowing up the heavier rig and going to 11.5 metres by the point of the bridge, I had a 3oz roach and missed a couple of bites but it was short lived and I went back to catching the odd small fish on the lighter rig. It sounded like Leighton and Stu were also both now struggling while the two below the bridge were still getting a fish a chuck! When Rob called the all out, my clicker was reading 86 fish and I thought I might scrape 5lb and the only chance I had of a pick up today was if Rob and Heardy framed and I beat the two above me and sneaked a section win by double default! 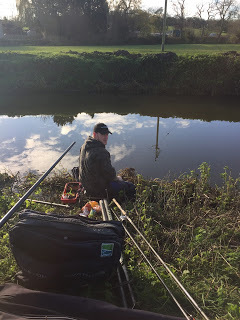 I packed up and we walked up to weigh Stu in, he’d had a similar day to mine and had sixty odd small fish plus a bonus perch for 3lb 10oz, Leighton weighed 6lb 11oz and I knew I didn’t have that, for once my guesstimate was pretty close as I actually weighed 5lb 2oz. 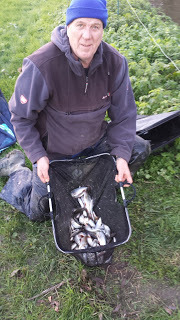 Below the bridge Rob had 10lb 13oz and Martin had 13lb 15oz which meant I was fourth in my five peg section which wouldn’t do my league position any good at all! *Thanks to Rob Cox for the photos. 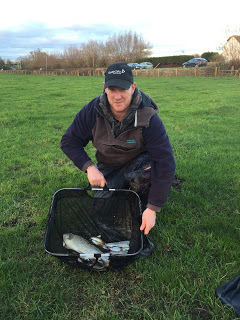 Back at the results and the other section had also fished pretty well with Fieldy weighing 10lb 12oz for third place overall, Frank had 9lb 3oz from peg 120 to win the section and Jake had 8lb 4oz from 129. 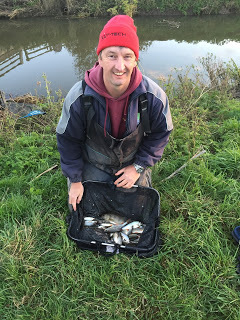 Steve Parker had 3lb 13oz from 126 so I was a pound better off, I should have been £2 up but Stu did a runner without paying! After three matches and dropping the worst result, Fieldy and Heardy are on three points followed by Frank on four and Justin on five. I’m currently languishing way down on seven points and need a good result in the next match, in my defence the three pegs I’ve drawn so far 123, H6 and H4 haven’t been great. Get in the drawbag early, it's the only way you know the good Pegs are still in there! Trust your own drawing arm not others lol! Think you're right Tim, I'm going in early next week! Stick some pegs in down Midelney and see what turns up!